I don't think we've ever told the world that Sierra is a HOOVER vacuum. 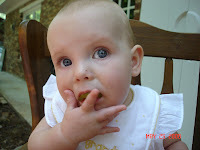 She will eat anything. Seriously, ANYTHING! 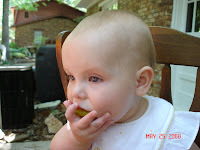 We had a killer BBQ at my Mom's house for the holiday and little Miss Sierra sucked this pickle dry before she devoured it. She is such a little weirdo! 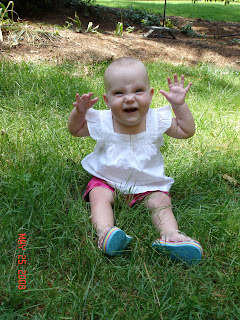 Then we had a photo shoot in the front yard and this was her best shot. she is too cute!! you always dress her to the T's. wish i had another little girl for you to pass her clothes to. i wish my kids ate that good! She looks like such a big girl in these pictures - but she is so bald! Very cute!